For every half-baked, half-bitter “millennial” thinkpiece there are innumerable young activists and progressives, some of them not even yet tweens, gearing up to make this dumb nation a more inclusive, accepting, and forward-thinking place to live. 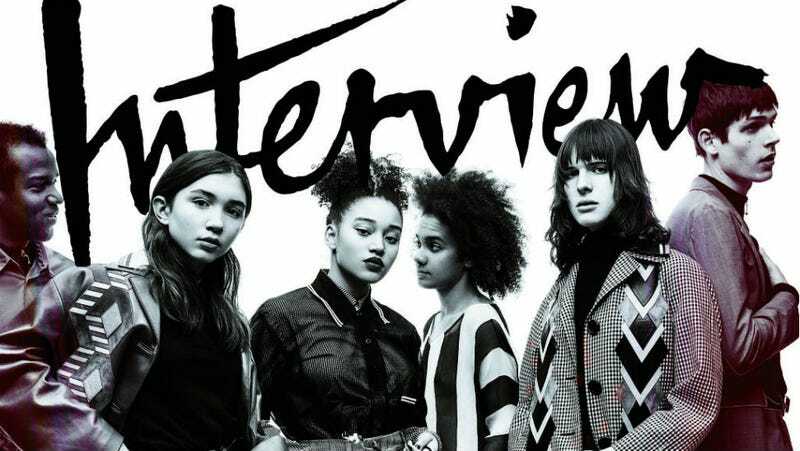 Spend three minutes on the social media platform of your choice and you’ll find a dozen or five, and the latest issue of Interview—a magazine more inclined to profile actors, musicians or artists—is dedicated to the most prominent among them. You might not yet know the individuals on the cover, but you will before too long. Perhaps most recognizable are the young intersectional feminists Amandla Stenberg (a 17-year-old actor who captured the world’s hearts as Rue in The Hunger Games) and Rowan Blanchard (14-year-old actor who stars on the Disney Channel’s Girl Meets World). And there’s Ethan James Green, a photographer whose early portraiture included fellow cover star Hari Nef, trans model, activist and Transparent cast member. There’s also Emmanuel Olunkwa, an activist-photographer, and Tyler Ford, “agender writer, speaker, media personality, and model” (and, disclosure, also my really smart friend). “I’m so impressed by how nimbly they [the activists] can navigate between issues,” said Wallace, who explained that there’s “solidarity” among activists in this generation, and thanks to social media, they advocate for easily many causes, not just one. The magazine also includes interviews with fellow activists and multi-hyphenates like Deray McKesson, Jane Fonda, Chelsea Manning, and Cecile Richards. It hits stands this Friday.